The KidsAid concert with 4 of Australia’s Favourite Artists joining together for the biggest event of the year. Jessica Mauboy, Elen Levon, Sarah De Bono & Josh Brookes will be performing all of their biggest hits in support of this event. Opening the evening with Platinum Dance Tours performers, Eden Altham, Jasmine Murray, & Top Impact Crew. 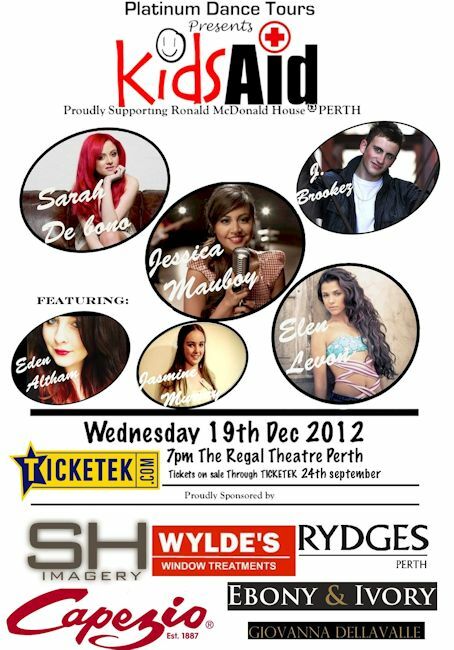 Never has an event so huge come only to Perth, supporting a great cause with the best in entertainment. All proceeds of the KidsAid concert will go to Ronald McDonald House Perth, helping the families of WA’s children with illness or special needs. Additionally, Platinum Dance Tours are running a huge workshop in Perth, including Morgan Choice, Cory To’o, Katie McMahon, Jet & more, over the space of a week in the summer. To win a FREE ENTRY TO ONE OF THESE AMAZING WORKSHOPS, contact us here at win@dancelife.com.au and tell us why you’d love to take class with these amazing choreographers! Act 2: 8.30pm Approx Finish: 10pmPlease Note: Running times are approximate and may be subject to change. Previous Post DAVID ATKINS Returns - HOT SHOE SHUFFLE!